After five years in the making and a Kickstarter campaign last autumn, Trzes' Mamluk deck is finally available for sale. 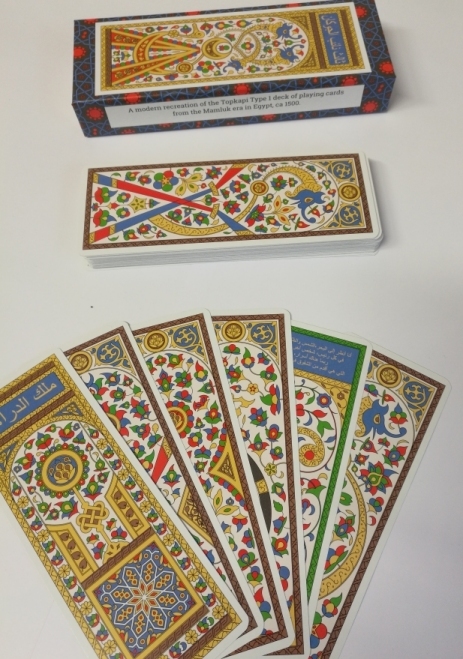 You get a modern recreation of the so called Topkai Type 1 deck of Mamluk cards, consisting of 56 cards, plus 5 extra cards with recreations of the remaining Topapi Type 2 and 3 cards. They come in a posh box with a small booklet. Also included is a folded up A3 sheet showing the structure of the deck. If you want to learn more about the history and reconstruction of this deck visit mamluk.spiorad.net. The price is 38 Euros plus shipping. Shipping costs are 9 Euros worldwide. Just select an option from the combo box below and then click on the PayPal-Button to order. You will get a confirmation email from PayPal and a shipping notification from trzes-art. However it may take up to a week to ship your items. For bulk orders and wholesale prices please get in touch via email. Home: shop.spiorad.net • Contact: write to trzes at spiorad dot net. The images on this site are copyright protected.